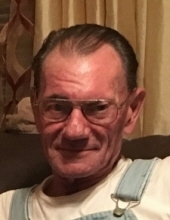 Steve Bobby Tincher was born February 6, 1949 in Jackson County and departed this life Wednesday, October 17, 2018 at his residence in Annville, being 69 years of age. He was the son of the late Robert & Lucy (Peters) Tincher. Steve is survived by two children, Sherry Lakes and her husband Jeff of McKee and Steve Tincher Jr. and his wife Lori of McKee. He was blessed with four grandchildren, Trevor (Amanda) Lakes, Jarrod (Julia) Lakes, Kayla Tincher and Virgil Knox Tincher and by one great granddaughter, Riley Lakes. He is also survived by his special friend, Judy Isaacs and her daughter, Patty McQueen her husband John. In addition to his parents, Steve was also preceded in death by his siblings, Alvis Tincher, Nellie McIntosh, Phebe Reece, James Tincher and Virgil Tincher. Visitation 12 Noon Sunday at the funeral home. "Email Address" would like to share the life celebration of Steve Bobby Tincher. Click on the "link" to go to share a favorite memory or leave a condolence message for the family.